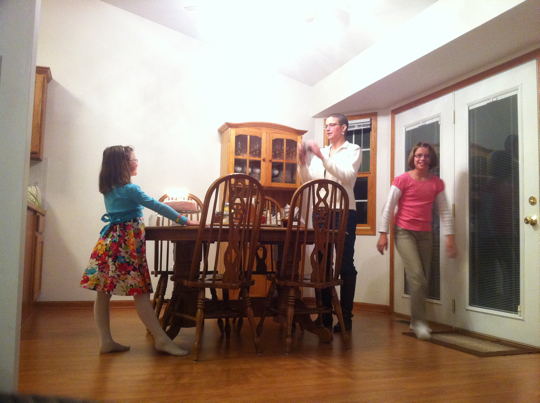 A Happy Birthday was had by Bethany, our goddaughter. The Gebhardts invited a bunch of strangers to come to their house, but it turns out that the ones who showed up were actually people they knew. It was very festive, with presents and cake and everything, and the birthday girl was very gracious with her ‘Thank You’s and appreciative smiles. 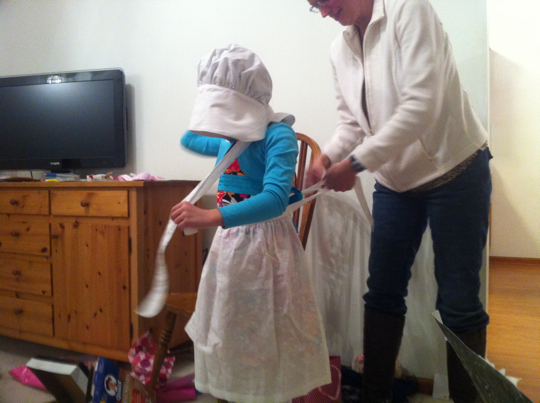 She (and sister Macy) scored big with homemade bonnets and aprons from Gretchen! Little Lauren from Long Ago almost burst forth from my psyche and stole them. I would like to have a word with her past teacher in Utah, however. She sent a sweet package of greetings from former classmates and also a personal card with five bucks! Cut it out, Past Teacher – you’re making the rest of us look bad. I love how their house looks so clean and uncluttered. Those bonnets and aprons are just too cute. And lest some of you think that I am complimenting myself, I am not the Gretchen who made them. And congratulations to L&L for keeping up contact with a goddaughter. Now I feel guilty about a godson I’ve never even visited. Ack! But at least whenever I’m reminded of him and feel guilty, I pray for him. That’s got to count for something, right? Ha! Don’t congratulate us too much -- they had to move here for us to do something. Gretchen -- yes, it is very nice! Plus it has that ‘just moved in’ smell. That’s what that smell was? And as much as I love LHOTP, I’ve often wondered what I would miss most if I could go back in time. Showers? TV? Air-conditioning? Transportation? Taskykakes? And what don’t we have now that future generations will wonder how we survived without? An excellent way to spend a birthday! 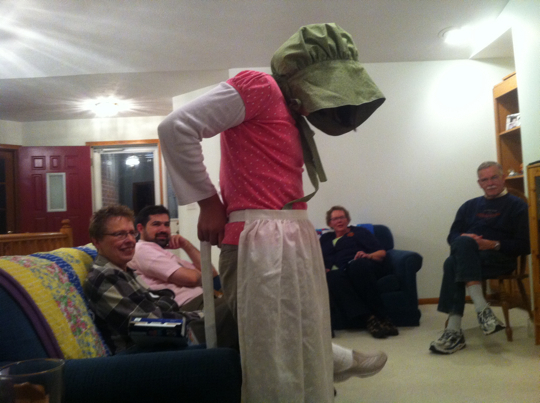 And will Bethany be wearing the apron and bonnet for Halloween? Yes, the girls will be Pioneer Girls for Halloween. That’s why Macy had to get her present early. We all had a great time. Thanks to all who helped us celebrate. Also, I do not take credit or blame for any house smell as I cannot smell at this time. Past teacher needs someone to give the birthday girl a big birthday hug. Unless birthday girl can wait until Christmas when past teacher will come and visit!